(leading to ExpertRating Drawing Skills Certification). This course includes a knowledgeable and caring instructor who will guide you through your lessons, facilitate discussions, and answer your questions. The instructor for this course will be Chad Walker. About the ExpertRating Online Drawing Course instructor : Chad Walker has been actively involved as a computer game artist, comic book illustrator, and instructor, teaching both traditional art courses and courses in 3D modeling for computer games. Chad attended the exclusive Joe Kubert School of Cartoon and Graphic Arts Inc. in New Jersey. He is the conceptual designer and artist of several award-winning games, including Age Of Empires/Age Of Kings and Age of Conquerors. Chad also laid the groundwork for Microsoft's Age of Mythology, created the artwork for three strategy guides, and works with Rob Liefeld, a legendary comic artist and writer. Chad joined forces with his twin brother Eric to write the popular gaming book Game Modeling Using Low Polygon Techniques. Chad and Eric are the co-founders of Walker Boys Studio, which produced the highly acclaimed game Civil War: War Between the States. Drawing for the Absolute Beginner requirements: For taking this instructor led ExpertRating Online Drawing Course you need Internet access, e-mail, and the Microsoft Internet Explorer or Mozilla Firefox Web browser, and any type of computer. "Hi Chad, I am enjoying your instruction so much! I have been in and out of the world of drawing all my life and it's so good to be doing it again and it's like you have unlocked the secret box." "I thoroughly enjoyed this class- and I will recommend it to others!" "I thought this was an excellent course with just the right amount of information and instruction to allow me to continue to pursue my interest in drawing. I felt as if Chad had a good time with it and I did as well. I especially enjoyed his sketches and have a new appreciation for comic book art!" "It was a fun course and the instructor's comments were amusing. I improved my drawing skills and learned about some new techniques." "I would like to thank you and your staff for taking the time to assist us with our projects. It helps to be able to use Flikr and MySpace to post work, then get tips and pointers from others as well as the staff. I have been drawing since I could hold a crayon, but never had any formal training. After this class, I understand why I draw certain ways and can now make better progress with my pictures. I truly enjoyed this class. Thank you again for all of your help." "Just wanted to say thanks for the instruction. Your guidance in the past 12 lessons was a great start. I also realize that there is much more study and practice required on my part. I have seen a great improvement in my drawing by simply implementing many of your suggestions. Thanks again for taking the time to transfer your knowledge." "This has been great Chad. I have been working as a commercial Artist for over 30 years and thru the years I have sort of 'lost' the ability to 'see' in order to paint for me and not for some nameless consumer that doesn't care one whit what talent it took to create. I have found my creativity again. Thanks so much for your fresh approach to teaching. You are very down to earth and your lessons were done with great clarity. I hope all beginning artists have a chance to have you as their first instructor. You are very inspirational." ExpertRating is one of the world's only ISO 9001:2015 Certified companies (from TUV America) offering an Online Drawing Course (leading to ExpertRating Drawing Skills Certification). When you choose the ExpertRating Online Drawing Course you can be sure that you are buying a premium International certification that is recognized by hundreds of employers and Government bodies in the US and other countries. With ExpertRating you get certified quickly online and you are equipped with a store house of information through the in-depth ExpertRating Online Drawing Courseware which has been developed by experienced Drawing Experts. The ExpertRating Drawing Skills Certification is by far the best value for money instructor led Drawing Skills Program at $129.99. 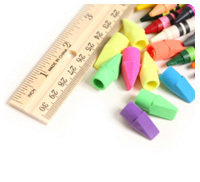 How much does the Drawing Skills Certification cost and what does it include? You can buy this ExpertRating Online Drawing Course leading to Drawing Skills certification at a special offer price of only $129.99 which includes the in-depth ExpertRating Online Drawing Courseware and exam fee. This is the best value for money Drawing Skills Program available till date. You get the following services within the USD $129.99 fee. In-depth ExpertRating Online Drawing Courseware including scenarios and case studies. World wide airmail delivery of the hard copy Drawing Skills Certificate. 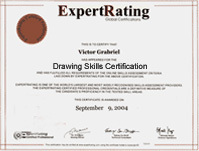 The Drawing Skills Certificate can be used to prove your certified status and does not mention the words "online". The process of getting yourself certified is very simple. All you have to do is buy the ExpertRating Online Drawing Course for $129.99. Log in to the instructor led course using your password. Go through the ExpertRating Online Drawing Courseware (which would take you 6 weeks) and complete the final Drawing Skills Certification exam at your convenience. 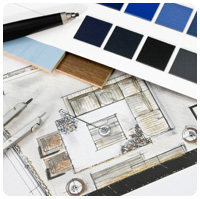 You can complete the exam within 2 months of buying the Drawing Skills Certification. The result of the exam appears as soon as it is completed, and your Drawing Skills Certificate is mailed immediately. Chapter assignments to help you practically use the Drawing Skills that you will learn during the Drawing Skills Course. The final exam is fully based upon the ExpertRating Online Drawing Courseware that is provided along with the Drawing Skills Certification. If you have gone through the courseware properly you should not have a problem clearing the exam. The exam consists of multiple choice questions from all chapters of the ExpertRating Online Drawing Courseware. ExpertRating instructor led courses commence every month, you can always choose a suitable date for your course commencement in any month. To see available course start dates, please click on "Buy the ExpertRating Online Drawing Course" link. All courses run for six weeks, with a two-week grace period at the end. Two lessons are released each week for the six-week duration of the course. You do not have to be present when the lesson is released, but you must complete each lesson within two weeks of its release. Artists are in great demand! According to a survey conducted by the U.S. Bureau of Labor Statistics, artists held about 218,000 jobs in 2006. Drawing is a visual art which makes use of common instruments like pencils, pens, paint brushes, crayons, chalks, markers and pastel colors to draw two dimensional figures. Figures can be drawn on papers, cardboards, plastics and canvases. Cartooning and expressing oneself publicly through graffiti are also part of drawing. Drawings may be a symbol of something, showing show some objects or of some living beings. Drawings can be made as a hobby or for artistic or technical purposes. Artists draw to convey ideas, thoughts or feelings. You can learn how to draw or enhance your drawing skills with the help of the ExpertRating Drawing Certification which will teach you the nuances of drawing. Have you ever wondered what kind of tools you would need to become an artist? Going into an art store can sometimes be overwhelming, so this first lesson, will take a look at the basic tools and supplies an artist needs for various projects. After you understand the tool set, you'll be prepared to confidently go to your local art store and start experimenting with supplies! With your art supplies in hand, it's time you get a firm understanding of drawing basics. This lesson will look at the importance of the silhouette and the outlining shape. When beginning to draw, it's so important that you understand the shapes you look at and how to put them onto paper. You'll also learn an amazingly fun one-eye drawing trick! This lesson will go over the two major components of drawing for the beginner. You'll find that the first challenge you're faced with is drawing from things you see. This is, after all, how everyone learns to draw. You'll gain lots of great tips on how to draw what you see, how to set up scenes for photographs, and much more. Did you know that there are five forms of light? That's right! You'll learn how to illuminate the scene and change the mood all at once. This lesson will go over lighting and shading so you'll have all the knowledge a beginning artist needs when learning how to sketch (and more). Have you ever drawn a picture and realized that it looked quite flat? Well, that might be because you never added light to your images. Students will learn how to add light, and more importantly, shading! Perspective has always been a necessity for anyone drawing pictures with depth. If you wanted to draw a set of buildings and have the viewer looking down the road, how would you do it? One, two, and even three-point perspective is how! In this lesson, you'll learn how to find the horizon line, create depth in your page, and even find the vanishing points of your lines. It's time to make a spoon "feel" like a spoon and a rock "feel" like a rock. When you're drawing objects, it's important to create the sense of realism with line work. So this lesson will go over some important rendering techniques that will give you a jump start toward understanding gradation, line weight, and stylization. All of which will get you on the road to finding your own style and creative expression. It's all about telling your story! If you see a drawing of a big arrow pointing to the right, you'd probably look to the right, wouldn't you? In this discussion on layout and design, this lesson will look at what it takes to persuade your audience to look at certain spots on your images at particular times without a big arrow. Sounds tough, doesn't it? Well, this lesson will show you some great methods and proven techniques for controlling everything you draw. Do pink and blue go together? Great question! What about the shadow color on an apple? What's the compliment to green? Creating images in color requires taking your artistic understanding to a whole new level. This lesson on color composition will be one of the most exciting and rewarding lessons in your art education! This lesson will walk you through the future. That's right—in this lesson you are going to look at and draw the techno future. You know those cool robots in movies and orbital vehicles flying around in space? Well, after you complete this lesson, you'll have a great understanding of how to create your very own future. This lesson is a great chance to get up close and personal with animals because it's packed full of measurements, proportions, and basic shapes for many of the animals around you. You'll be using a lot of what you've learned from the previous lessons in this course in order to bring your animal together. This lesson will look at step-by-step techniques and sketches you can use to help draw monkeys and other crazy animals. It's time to stop monkeying around and start drawing! The final lesson will explore the human brain and how it functions to create art, learn memorizing and interpreting the world around you and keeping everything slightly straight in the process. You're going to take those images and thoughts in your head and put them down on paper for everyone to see and enjoy!